The California Highway Patrol released this video showing the rescue of two hikers who got lost in the snow while hiking in Yosemite National Park. 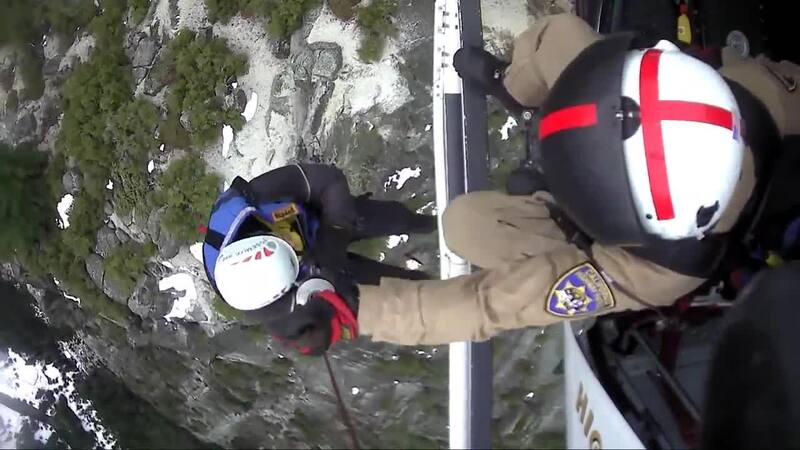 YOSEMITE NATIONAL PARK — California Highway Patrol Central Division Air Operations has released a video of the helicopter rescue of two hikers who got lost in the snow in Yosemite National Park. Accoridng to CHP, on Wednesday, January 16 around 7 a.m., CHP Helicopter-40 (H-40) staffed with Pilot Officer Scott Rodda and Flight Officer/Paramedic Dustin Henschel responded to Yosemite National Park for a rescue. According to park officials, two male hikers from England, in their mid-20’s, had become lost in the snow while hiking in the area of North Dome the day before. The hikers say they attempted to descend into Yosemite Valley when they lost the trail in the snow and became trapped in a crevasse. They were able to call 911 from a cell phone. After locating the hikers, H-40 landed in Ahwahnee Meadow to meet with Yosemite National Park Search and Rescue and devise a plan. H-40 and Search and Rescue decided that inserting two Search and Rescue Team members would be the fastest and safest means of rescuing the two due to an impending and severe winter storm. The two team members were inserted with rescue gear that enabled them to reach the hikers and raise them out of the crevasse to a safe and relatively flat location, above the cliff they had slept on overnight. Once the two hikers were placed in rescue harnesses, H-40 returned and hoisted out each victim one at a time. They were then transported to Ahwahnee Meadow where Yosemite National Park Paramedics were staged to receive and treat the two cold and wet hikers.